Take a peek in your waiting room – what do you see? If you’re like many practices you’ll see patients passing the time on their phone or tablet – devices filled with apps that your patients are using on a regular basis. Before you jump on the bandwagon and try to develop your own app – PAUSE. 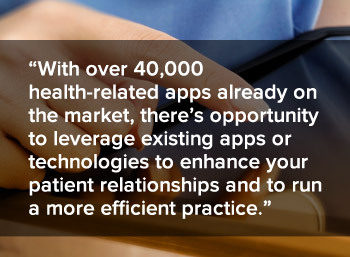 With over 40,000 health-related apps already on the market, there’s opportunity to leverage existing apps or technologies to enhance your patient relationships and to run a more efficient practice. As one of the most popular health apps available MyFitnessPal allows patients to set weight management and fitness goals, track their food intake and exercise. It has one of the most robust food journals we’ve seen with over 2 million foods in the database, with calorie, fat, protein, carb, sugar, fiber, cholesterol content and beyond. Diet and exercise logs can also be printed or emailed. MyFitnessPal is available in an app for Apple, Android and Windows devices, but can also be used via their website, and boasts the perfect price point for your patients – free. By default, many devices include some type of reminder application. However, more robust versions are also available which allow patients to set reminders for taking prescriptions or supplements (or refilling), workouts or relaxation time in addition to appointments. Like most integrative medicine practices, managing stress is an important part of any plan of care. Often, patients are told to put down their phones, and step away from their computer or TV, and enjoy some quiet time. The truth is, sometimes that’s just not possible, in those cases technology can help facilitate an “escape” when a real one isn’t available. Apps such as “Take a Break”, allow patients to “escape” with a variety of white noise or nature sounds with optional meditative narration. App use doesn’t have to be limited to the traditional “download this app” – app use by patients can also be facilitated through your office on your practices devices. PatientPad is a solution that utilizes tablets, which are placed in the waiting room or at the reception area, to allow patients to view testimonials, check-in, write reviews, or browse relevant health information – all via HIPPA secure device. Orca Health (in partnership with Harvard Medical School) allows you to prescribe education to your patients including interactive videos and images (well beyond the patient pamphlet). It can be used as a way to deliver personalized health information by allowing you to take photos and videos of your patient’s personal medical imagery, draw on them, and send them directly to your patients – all of which is hosted on Orca’s HIPPA secure servers. Current apps include Spine Decide, Hand Decide, Heart Decide, Knee Decide and more. Remedy Reminder is a web-based portal for healthcare professionals and a mobile app for patients which work together to remind patients of recommended supplement doses and create a plan of action for patient adherence. Healthcare professionals can log into the portal to write prescriptions and post dosing/lifestyle instructions for the patient to access. The portal also provides an up-to-date report detailing patient adherence to the provided instructions. Patients are able to download the free app to access any information input by the provider. The app also allows them to add additional products prescribed by other healthcare professionals.